I became introduced to Melissa Foster through a contest celebrating the launch of her most recent title, Come Back to Me, in early November, 2011. I saw the book cover but, before I had the opportunity to read the book description, I watched the video trailer; I was sold. Even so, after consulting with Melissa and learning that Megan's Way was her first book, it was the book I decided to read first. 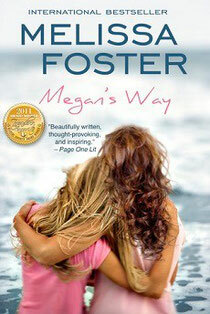 Megan's Way is, essentially, the story of a mother and friend who is losing her battle to Ovarian Cancer. She is forced to make a powerful choice: to die sooner rather than later by not taking her medication - to spare those she loves most from seeing her suffer for an extended period of time - or to take the treatments and prolong her own agony as well as the suffering of her daughter and closest friends. Regardless of her choice, she will still die; selfishly, I hope I am never placed in such a position. This story is, at the heart, a celebration of life - Megan's life. I was made aware of the choice she, ultimately, made and I witnessed how her closest friends rallied around her during her time of need. I also witnessed how her daughter struggled at the thought of losing her mom; it didn't matter that she would be taken care of afterward. There is much more to this story than meets the eye. Granted, the bonds between four friends who have known each other for years remain unshakable from beginning to end. However, I saw glimpses of regret, guilt and jealousy revealed in one character; I wondered why. I was also made aware of secrets hidden beneath the surface and, as the story unfolded, I realized that very little was actually as it seemed. Just when I thought I had it all figured out, I was thrown another curve ball. Even so, silent suspicion was evident. Megan's Way was intriguing. It was all-encompassing in terms of the elements contained within the story. There were so many rays of hope and light that there is no way I can think of this book as a tragedy. It's a testament, of sorts: a celebration of life, freedom and youth and a celebration that tomorrow does, indeed, hold promise even after the heavy rainfall of today. Would you like to unravel the mystery? Would you like to witness a celebration of life possibly unlike any you've celebrated before? If so, Megan's Way is definitely a book you will enjoy. You can learn more about it, or purchase it, by clicking the book cover which will take you to its page on Amazon. If you would like to read my review of Chasing Amanda, please click here. To read the author interview I had with Melilssa Foster, please click here.